A blog post from Flickr about new updates to its iOS application went relatively unnoticed yesterday. The post announced a series of incremental improvements to an app which has so far barely managed to catch up to the competition after months of abandonment, but has yet to really impress. The latest build brings a few now-standard features like the ability to save photos to your Camera Roll, communicate with @ replies, and more. It’s nothing to write home about, so to speak, which is why the majority of the news-hungry tech blogs didn’t prioritize it on a day when Google was announcing new hardware (a high-end Chrome OS laptop called the Pixel, which actually does impress). That being said, Flickr is still an important network to watch, especially because it has managed to maintain a foothold and consumer brand, even as Facebook has triumphed as the de facto place where users now go to upload and share photos with family and friends. Flickr, had it not been starved for innovation inside the machinery of a floundering Yahoo, could have even competed with Facebook, given its head start, once highly engaged user base, and massive collection of some 8 billion+ photos. The tech blogosphere is now rooting for new Flickr and new Yahoo, given that we all like new CEO Marissa Mayer just so darned much. But if the company waited a year before the app update that arrived in December introducing the world to Yahoo’s new vision for Flickr, maybe it should have waited a little longer until it really had something radical and new to show us. Flickr is no longer a terrible, horrible, no good, very bad app, as it was pre-December revamp. The older version was a slow, buggy destroyer of image quality. And worse, it forced you to upload photos one-by-one. Yes, in 2012. Meanwhile, the new Flickr for iOS is an entirely different application. It’s fast, solid and well-built with a smart and attractive user interface, and even some trendier features like filters. Yes, filters are trendy. Ten years from now, I imagine we’ll look back on them and giggle a little about the hipster-fied 2010’s, with our skinny jeans and insta-aged photos. Filters, after all, are a way to evoke nostalgia in an age where everything moves a bit too quickly, and no one has time to pause and reflect. When the coldness of digital photography and the ease and ubiquity of camera phones means we now have 50 pictures of a moment when we used to have one. Filters are a way of saying to ourselves: stop, this moment is important. I’m selecting it specifically. I’m differentiating it from the stream. Filters are solving the problem of too much/too fast, but that’s a problem that will eventually be solved by smarter technology. And Flickr would have done well to launch an app that was, at the very least, heading in that direction when it re-birthed itself over the holidays. As it stands today, the app is instead seemingly working on a list of checkboxes of what a photo-sharing, social mobile application should be about. Does it have filters? CHECK. Can you @ reply to friends? CHECK. Share to the social web? CHECK. Post to Tumblr? CHECK. Save photos locally? CHECK. Multi-upload? CHECK. What it hasn’t done yet is really surprise us. A number of startups have tried, failed and are continuing to try to make sense of our fragmented, vast and exponentially growing photo collections. Facebook, too, is quietly experimenting in this area, following Google+ and Dropbox’s lead by introducing automatic, background-enabled photo uploads. The feature is always optional, however, as today, users worry about privacy and bandwidth issues. These concerns will reduce in time, especially as micro-networks like Snapchat pop up to provide outlets for private sharing at the same time as bandwidth costs decrease. Making not just faces and places searchable – making anything searchable in your photo collection. Show me photos of my house when it was being built; those new skiis I bought last year; that garden I visited on our last vacation; the photo of my grandparents at my kid’s 3rd birthday party; my friend Joe doing a keg stand; photos of mom and dad smiling; Whatever! Automatically grouping and tagging related images, as well as those from your friends who have shared with you, or who have shared publicly to the web. Hiding (but not deleting) the blurry or out-of-focus uploads. 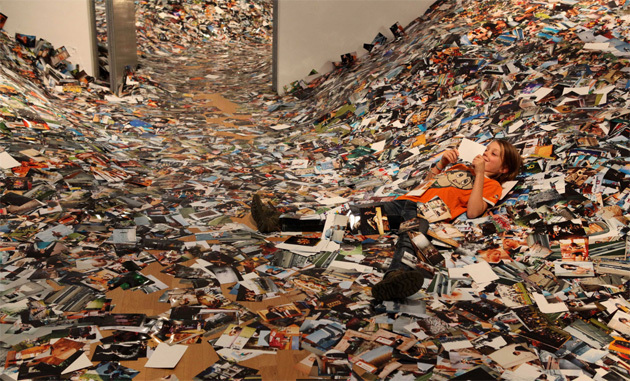 Offering a scrollable timeline of your photo-sharing history. Helping you find photo groups that match your interests through intelligent recommendation technology. This is off the top of my head, so I’m sure Yahoo has these things in its sights at least. What’s odd to me is that it didn’t come running out of the gate really nailing at least one of the above, when each item listed is currently in development by a photo-sharing startup somewhere. Everpix, for example, is tackling the problem of filtering the bad photos from the good and building object-recognition algorithms. Tracks helps you find photo streams that match your interests. Flock, Moment.me, Flayvr, new arrival Albumatic, and others group photos from you and friends (or strangers) based on time and place. Timehop and just-acquired Memolane let you delve into photos of days past. The technology is out there, it’s just a matter of finding everyone’s price tag. And Flickr should because the time to catch up with other photo apps was over two years ago. Now is the time to out-innovate them or die trying. Because the story we want to hear is not how Yahoo killed Flickr; we want to hear how Yahoo saved it.